Add the appeal of crab legs to your hors d’oeuvres with Crab Classic Leg Style. Made from a blend of wild caught, MSC-certified Alaska Pollock and real King Crab Meat, the legs are most often served as an appetizer with dipping sauce or as the main ingredient in California- style sushi rolls. They can also be cut and added to seafood salads, chowders and more. 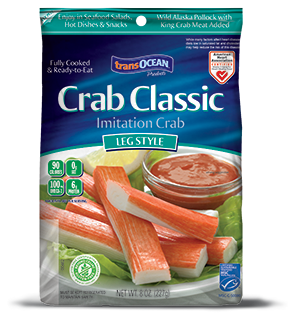 Fat free and low in cholesterol, Crab Classic Legs are certified by the American Heart Association. They are also a source of Omega-3 EPA and DHA, providing 100mg per 3 oz. serving. This product is certified gluten-free by the National Foundation for Celiac Awareness as produced in a 100% dedicated gluten free facility. Products displaying the heart-check mark meet American Heart Association food criteria for saturated fat and cholesterol for healthy people over the age of 2. This product comes from a fishery which has been certified to the Marine Stewardship Council’s environmental standard for a well-managed and sustainable fishery. Health professionals worldwide endorse Omega-3 as essential to good overall health. Supportive but not conclusive research shows that consumption of EPA and DHA Omega-3 fatty acids may reduce the risk of coronary heart disease. One serving of Crab Classic provides 100mg of EPA and DHA.